Michael has worked in property leasing, management, and real estate sales since 1978. Michael is the 3rd Generation of McCreary’s & King’s in the family business. Michael is a Certified Property Manager® (CPM®), a designation earned from the prestigious Institute of Real Estate Management® (IREM®). Michael has earned the Master Property Manager (MPM®) and the Residential Management Professional® (RMP®) designations from the National Association of Residential Property Managers® (NARPM®). Michael is a Past President of the Cobb Association of REALTORS® and a Life Member of the Million Dollar Club for residential leases. In 2010, Michael was presented the Phoenix Award representing Ten Years of Membership in the Club! Michael was previously voted CPM® of the Year by the Atlanta Chapter of IREM® and REALTOR® of the Year by the Cobb Association of REALTORS®. In 2014, Michael was awarded the Professional Achievement Award from IREM®. In 2015 Michael was awarded the Volunteer of Year Award from NARPM® National. Michael is an Instructor with IREM® and NARPM® and enjoying passing on his knowledge to the next generation of professional property managers. Michael directs all aspects of the firm’s operation and scope of services. An avid photographer, Michael oversees all photography for the company. 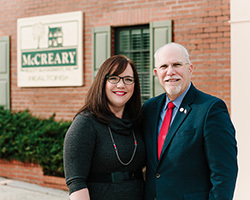 Bess is the 4th generation member of the McCreary/King family business and has been working full-time with the company since 2010 working her way up from Administrative Assistant to her current position. Bess is a trained actor/educator with a bachelor's degree in Theatre from Armstrong Atlantic State University in Savannah. Having worked as a professional actor and educator for 6 years, Bess developed a strong sense of creativity which she applies to her work with owners and tenants. Bess is a member of the National Association of REALTORS®, Cobb Association of REALTORS®, Institute of Real Estate Management® (IREM®), National Association of Residential Property Managers® (NARPM®), and Community Associations Institute (CAI). She has earned the Accredited Residential Manager® (ARM®) and the Certified Property Manager® (CPM®) designations with IREM® and the Residential Management Professional® (RMP®) & the Master Property Manager® (MPM®) designations with NARPM®. Bess is also an Active Life Member of the Cobb Association of REALTORS® Multi-Million Dollar Club 2015-2017. She is currently serving as a member of the Board of Directors with the Atlanta Chapter of NARPM®. Teri was first with McCreary from 1984-1995 and rejoined our staff in 2000 after a sabbatical to be with her young family. 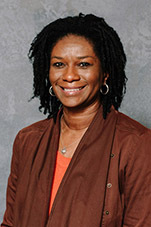 Teri earned the Georgia Community Association Manager state license. 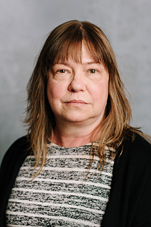 Teri has over 25 years of experience in Real Estate Management and will be pursuing her certification as a Certified Manager of Community Associations (CMCA) later this year, as designated by Community Associations Institute (CAI). Teri is the Office Accountant and administrates the accounting activities for our Homeowners Association and Leasing & Management portfolio. Teri produces all of the Owner Statements for our clients. She is very adept in extracting all manner of financial data from our Property Boss program for our Clients. Teri is an incredible asset to our firm and for our Clients & HOA's! 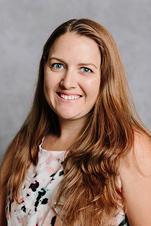 Melanie has been with our firm since 2006, and she brings several years of prior customer service experience to benefit our Homeowners Associations and their members. Melanie has earned the Georgia Community Association Manager state License, and is a member of the Community Associations Institute (CAI). Melanie has a Bachelor’s Degree in accounting and has earned certificates in both Project Management and Event Planning. Nikki has been with us for several years and was promoted to the position of Community Association Manager in 2011. 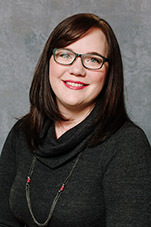 Nikki brings over 10 years of administrative assistance and customer service experience to our firm. Nikki has earned the Georgia Community Association Manager state license and is a member of the Community Associations Institute (CAI). Through various continuing education courses, Nikki has become very adept at navigating the many and varied issues arising in the day to day operation of a protective covenant community. Her excellent problem solving skills are a clear asset when working with the community Directors. 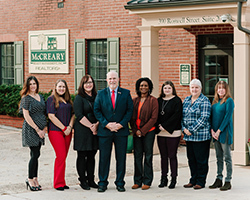 Michele joined the staff at McCreary Realty Management in March 2016. 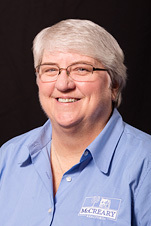 She has years of customer service and management experience and has brought her knowledge and friendly demeanor to our team. She is a graduate of Savannah College of Art & Design with a Bachelors of Fine Arts in Fashion Design. She brings that creativity into our team to enhance our customer and client experience. Michele is the first face you see and the first voice you hear when you call, so her helpful and positive attitude makes every client and customer feel welcome. Kellie has been a part of the McCreary Realty Management team since March 2017. 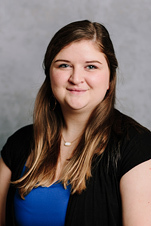 Kellie is a graduate of Kennesaw State University and has been working as a maintenance coordinator in single family property management for three years. She receives ongoing recognition for outstanding performance, professionalism and diligence, and maintains positive relationships with clients, tenants, and vendors. She joined the McCreary Realty Management team in March 2017. She’s a graduate of the University of North Georgia with a Bachelor’s in Business Administration with a focus in Management and Marketing. She has several years of experience in customer service and management in several industries. She brings a cheerful demeanor to our office and we are sure you will enjoy interacting with her in our HOA Department.